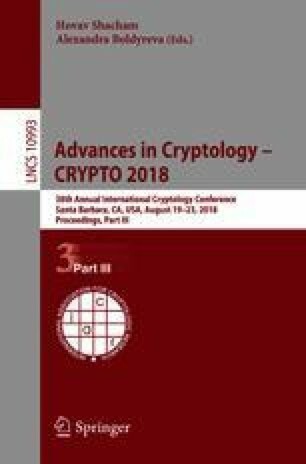 In this work, we propose a new public-key cryptosystem whose security is based on the computational intractability of the following problem: Given a Mersenne number \(p = 2^n - 1\), where n is a prime, a positive integer h, and two n-bit integers T, R, decide whether their exist n-bit integers F, G each of Hamming weight less than h such that \(T = F\cdot R + G\) modulo p.
This research was partially funded by the Singapore Ministry of Education and the National Research Foundation, also through the Tier 3 Grant “Random numbers from quantum processes”, MOE2012-T3-1-009. This work has been supported in part by the European Union’s H2020 Programme under grant agreement number ERC-669891 and the French ANR Blanc program under contract ANR-12-BS02-005 (RDAM project). The second author is grateful to CQT where the work has started during his visit.